Big Frog Mountain- Velux Flexible Sun Tunnels & Sky Lights- Natural Lighting For The Home! Are You Living With The Benefits Of Natural Light In The Home Or Workplace? Sun Tunnel Flexible Tubular skylight and Rigid Tubing skylight systems are *high quality* industry leaders in natural lighting. Installs in less than two hours in most cases and give years of energy saving lighting inside the home. Quality you can trust from VELUX® a company with over 60 years in skylight manufacturing experience. 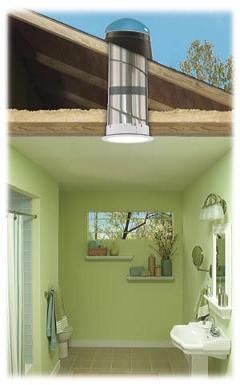 Affordable, efficient, and easy to install, the Energy Star® labeled Sun Tunnel skylight is perfect for lighting your hallway, bath-rooms, kitchen or anywhere that needs more natural light. Add the optional electric light kit to have light even after sun down. Sun Tunnels are now available in 10”, 14” or 21” with the patented flexible or rigid tubing which allows the unit to go around virtually any attic obstructions unlike other lighting systems. Real savings on your sky light installation costs! We now have rigid tubing skylight models, high impact dome models and Sun Tunnels for use on tile roofs. For flat Commercial roofs we now have 22" tubular skylights that are designed for easy installations in the office or warehouse. All models and parts are usually in stock in our warehouse and normally ship the same day ordered or next business day. The quality Sun Tunnel comes with a 10-year manufacturer's warranty by Velux and is built to last. Purchase Your Sun Tunnel Securely On-Line Here.